Experts debate the state’s grid storage future at ESNA conference. Ask a utility representative and an energy storage vendor to tell you how to measure the costs and benefits of grid storage, and you’re likely to get two very different answers -- particularly if you’re asking at this week’s Energy Storage North America conference (ESNA) conference. This isn’t a new debate, of course. Cutting-edge storage technology advocates and novelty-averse, reliability-obsessed utilities have argued over these issues for years. But this week’s discussion takes on a new urgency, since it’s no longer a theoretical problem. Last week, the California Public Utilities Commission issued its formal proposal to add an unprecedented 1.325 gigawatts of energy storage to the state’s grid by 2020, with the first wave of procurements to come by the end of next year. Along with this proposed mandate, however, comes a requirement from the state law that created it (AB 2514) that any energy storage that the state’s utilities procure must be deemed cost-effective. In fact, under last week’s proposal, while the state’s big three investor-owned utilities won’t be allowed to own more than half of the total storage capacity they’ll be required to procure, they can defer up to 80 percent of their biannual procurement targets if they can’t find enough cost-effective projects on offer. That’s not a free pass for utilities to delay, however. “To be clear, I want to see all reasonable storage procured, and all utilities must prove a procurement deferral is warranted,” CPUC Commissioner Carla Peterman, the author of last week’s proposal, said during Wednesday’s keynote address. Hashing out what’s reasonable or warranted on these issues, as Arthur O’Donnell, CPUC interim supervisor, said Wednesday, starts with a seemingly simple task -- to “define what storage actually is, and what it could do for the utility system. 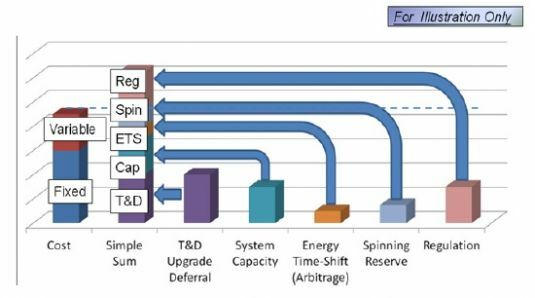 We did that by identifying a framework of storage applications,” with 31 different scenarios for energy storage, applied across a set of use cases. CPUC turned to the utility-funded Electric Power Research Institute for this analysis. During Wednesday’s conference, Ben Kaun, senior project engineer, laid out how EPRI’s modeling of these use cases yielded values that, for the most part, ended up being positive on a net present value (NPV) basis, as shown in the following chart. But this analysis is, by necessity, full of assumptions that don’t bear on case-by-case projects, he emphasized. 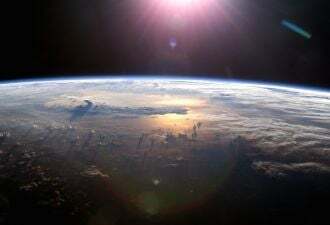 For example, it used energy storage technology cost figures provided by vendors and developers, and “that's not to say they aren't reasonable, just to say that they are forward-looking,” he noted. From the utility perspective, NPV values like these are not reassuring, according to David Castle, project manager for integrated planning and strategy for Southern California Edison. “The assumptions that we used in the EPRI models were much more aggressive cost figures,” he said. 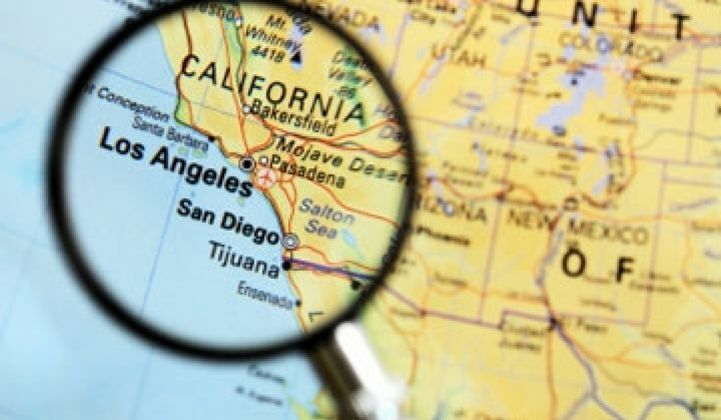 SCE is awaiting energy storage proposals for an upcoming RFP it’s issuing to meet an earlier CPUC order directing it to find 50 megawatts of energy storage as part of an 1,800-megawatt long-term procurement process for the Los Angeles area. “We look forward to seeing what those costs look like,” he said. Mark Irwin, director of technology development for Southern California Edison, also noted that the utility’s many energy storage pilot projects to date have all “gone through some fits and starts” that have delayed their ability to start interacting with the grid. Those delays range from fine-tuning its community energy storage systems being tested in Irvine, Calif., to needing to switch battery suppliers for its 8-megawatt Tehachapi wind power storage project after original supplier A123 Systems declared bankruptcy last year. That’s not proof that it can’t be done, of course. AES Energy Storage, for example, has successfully deployed more than 150 megawatts of up-and-running grid battery systems, including a 32-megawatt wind farm storage project using A123 batteries in West Virginia. Praveen Kathpal, vice president at AES Energy Storage, pointed out in Wednesday’s talk that storage assets should in fact be able to serve key grid needs at lower cost and far greater efficiency than alternatives such as gas-fired peaker plants. That’s particularly pertinent to helping California ISO, the state’s grid operator, manage the ever-growing mismatch it’s expected to experience in the late afternoon through mid-evening hours, when solar power supply falls off at the same time that residential air conditioner, lighting and appliance power demand starts to spike, as the following graph indicates. 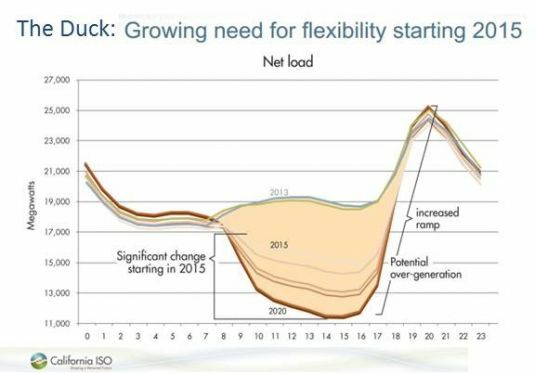 While conventional generation resources could help mitigate that ramp, “There’s also an opportunity here that you can store the energy during the low net load period, then you will have availability of that energy and be able to feed that into the system,” Mark Rothleder, vice president of market quality and renewable integration for CAISO, said at Wednesday’s event. Beyond the question of energy storage technology costs, there’s the issue of how much they’re worth to the grid -- and how much of that value comes in the form of cold, hard cash. As we’ve noted in ongoing coverage, grid-scale storage is most cost-effective when it can capture revenue streams from multiple functions, ranging from fast-reacting, lucrative frequency regulation and ancillary services, to the value it can provide in letting utilities avoid expensive infrastructure upgrades. 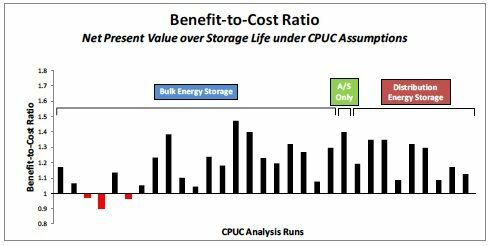 EPRI’s analysis offers an illustration of how those “stacked” values can turn an otherwise money-losing storage deployment into a money-making one, which the following chart makes clear. But as O’Donnell noted, “not all of those revenue streams are monetized, or associated with real markets.” Take the value of frequency regulation, or injecting and absorbing power into the grid at response times of as little as four seconds. Kaun noted that much of the value of its storage scenarios was driven by frequency regulation revenue potential. 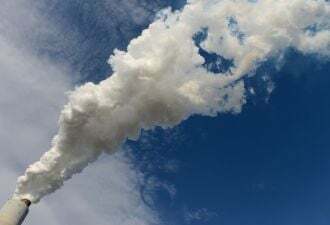 But California’s frequency regulation regime also includes various restrictions, including a minimum 1 megawatt of resource to participate, that make it harder to play into than in other markets, such as the one run by mid-Atlantic grid operator PJM. At the same time, making an upfront energy storage investment based on uncertain future market prices for services like these is inherently risky, Castle noted. “We don’t know for sure whether they’re going to be higher today or closer to their more moderate current levels,” he noted. Chris Edgette, senior director of the California Energy Storage Alliance, countered that well-designed and implemented energy storage projects can shift between different services as markets change, just as traditional resources like gas-fired power plants can do today. New regulations at the federal level are also increasing the value that fast-reacting battery grid storage systems can receive for a variety of services like these. Beyond that, EPRI’s analysis didn’t take into account “a lot of values that weren’t even included,” he said, such as the value of grid storage’s ability to stabilize the grid and integrate intermittent solar and wind power, which is set to make up one-third of the state’s total power generation capacity by 2020. There’s also the question of how many things one energy storage system can be expected to do. Kaun noted that EPRI’s model prioritizes functions to account for the fact that, for example, a battery installed to delay the replacement of an overloaded transformer or grid circuit must “reserve the time for the storage to address that issue before we consider capacity and further ancillary services” that are dispatched in day-ahead to minutes-ahead timeframes. Indeed, one of the key variables that determines the long-term cost-effectiveness of energy storage is just where it’s deployed, Rick Fioravanti, vice president of distributed energy resources for DNV KEMA, said during Wednesday’s talk. “There are a lot of benefits; some of them you can’t quantify as a monetary payment,” he said. “But you can look at how the device impacts the grid itself.” That requires a more site-specific analysis of storage’s costs and benefits, something that DNV KEMA has helped provide to the CPUC, and is now commercializing the software it used for that analysis as part of a newly launched service to help utilities plan and execute energy storage projects. Irwin noted that Southern California Edison is also working on a distribution circuit energy storage pilot, with an eye on deploying battery-based systems that “our system will rely on to avoid an actual upgrade” of the grid itself. At the same time, customer-located energy storage could also help mitigate local grid instabilities. That could range from the megawatt-scale thermal storage energy projects up and running at California State University campuses and in deployments of Ice Energy systems in the state, to the battery systems being installed to store and balance the flow of power from rooftop solar PV systems -- another big concern of California’s utilities. The CPUC’s proposal does lay the groundwork for utilities to include energy storage deployed by customers. That includes existing programs like the Self-Generation Incentive Program and the recently instituted Permanent Load Shifting (PLS) program, as well as the possibility for utilities to enter into contracts with, or even jointly own, customer-based storage. 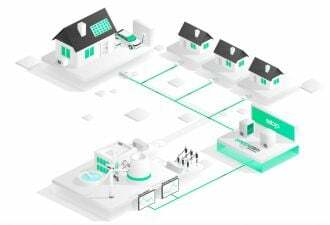 Once again, it’s yet another layer of complexity for utilities, third-party developers and individual customers to work out on the energy storage front.